I'm loved this colour since the moment I watched the video on Goulet Pens site. It's the kind of blue I was looking for, a beautiful, vibrant, saturated true blue. I ordered a bottle the first day, and I'm really happy with the product. Yes, I'm aware of the polemics about its waterproofness and bulletproofness. I wouldn't call this ink waterproof, personally, because some soaking can make the text difficult to read, but it's an ink that remains on paper even after extended immersion in water, so I can understand the logic behind the waterproof denomination it has been given. Anyways, if I want truly waterproofness, I have my Noodler's Polar Black or my Pharmacist's Iron Gall Ink. 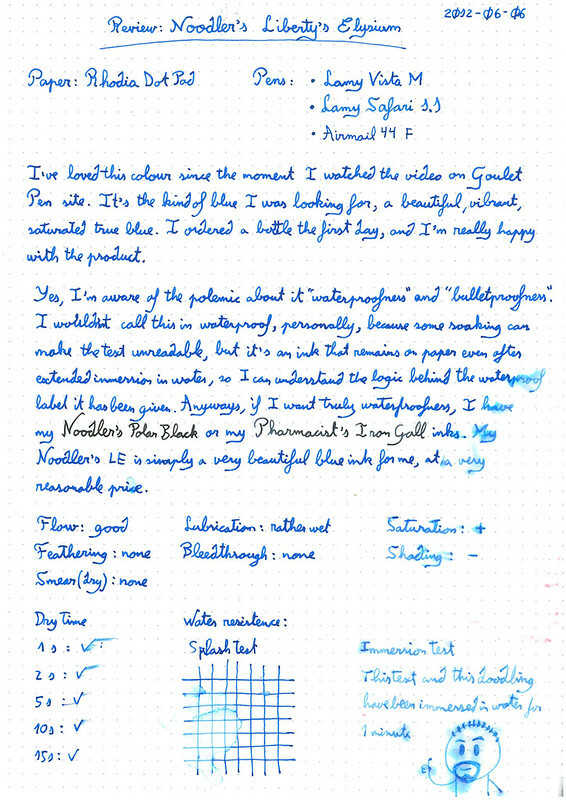 My Noodler"s LE is simply a very beautiful ink for me, at a very reasonable price. The waterproofness was interesting. Lots of dye begins to flow as soon as a drop of water touches it, making if difficult to read. But no matter of much water, there is always enough ink on the paper to be able to read the text. In fact, it can be read better after an extended immersion (like the doodling and text in bottom right of the page) than after only some drops of water (like some words at the middle-right of the page, that were splashed with water during the immersion test. As usual, I've posted a copy of this review on Fountain Pen Network.